When it comes to installing a reliable sump pump, the details matter. The patented sump pump systems designed and installed by Basement Systems include several top-quality components that work together to ensure reliable, long-term performance. 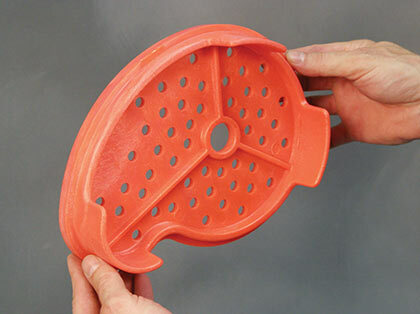 Basement Systems uses high-strength plastic sump liners instead of unlined sump pits. A liner does a better job of letting in water while keeping out sediment and debris. For even greater protection, we use our CleanPump® pedestal to support the sump pump. This patented pump stand keeps the sump pump's entry port well above the bottom of the sump liner, ensuring optimum pump performance. A simple feature like a sump pump stand can make a huge difference in the efficiency and function of your waterproofing system. All of our individual sump pump features make up a complete system, designed to help you avoid water and flooding problems in your basement or crawl space. Looking for CleanPump® product pricing? CleanPump® is a feature only available with a Basement Systems sump pump. Contact us today to find a certified sump pump installer in your area and get a free cost estimate with your in-home consultation.